America’s oldest surviving tea sets are almost 240 years old. However; this is relatively young compared to surviving antique Chinese export and Staffordshire tea sets from the 1600s. Many tea sets have survived relatively intact so long, due to the loving care they had over the centuries. It doesn’t matter whether you have a big, rambunctious family or live alone. You can display your antique tea set attractively now, while keeping it safe for future generations. Skip to Step 4 for households with children or pets, where fragile items must be protected from breakage. Purchase a large, metal tray with painted decoration in complementary colors to your tea set pattern at an antique shop or home décor store. Place the tray in the center of your dining room table, side table or coffee table. Place one or two white or ecru paper or lace doilies in the center of the tray. Place your antique teapot on top of the doily in the center of the tray, and arrange the cups in their saucers around the teapot. For another decorating idea, continue to Step 2. Otherwise, skip to Step 5. Purchase individual tea cup and saucer display racks from a craft store. Place each antique cup and saucer in your tea set in a display rack. Place the antique teapot in the center of your fireplace mantle or countertop. Push the teapot as close to the mirror or wall as possible, so it can’t fall onto the floor. Place the display rack tea cup and saucer sets on each side of the teapot, equally spaced away from it in line formation. For another decorating idea, continue to Step 3. Otherwise, skip to Step 5. Place a white or ecru lace table runner over the surface of your bedroom vanity table. Place your antique teapot to one side, toward the back wall or mirror. Place your antique teacups with saucers under them in decorative groupings, in front of the teapot and along the back of the vanity. Add potpourri or place tissue in the teacups, and fill them with jewelry. Hang three or four saucers with plate racks on the wall above the vanity in an inverted V pattern. For another decorating idea, continue to Step 4. Otherwise, skip to Step 5. Place your antique tea set in a china cabinet if you have children or pets in your household. Place the antique teapot in the center of the shelf and lean the antique saucers against the cabinet back wall on either side of it. Purchase cup hooks. Screw them into place on the underside of the shelf above the teapot. Ensure they are positioned on either side of the teapot in front of the saucers. Hang the antique tea cups in front of the saucers, suspended from the cup hooks. Elevate the teapot on a large roll of duct tape covered with a silk scarf, if it is small and short, so it is the most prominent piece in your decorative grouping. Take off the teapot lid and set it to one side of the teapot. Add a silk flower arrangement to the teapot. Hang two or three silk ivy vines from the sides of the teapot and drape over your decorative area. Place small, unnoticeable pieces of tissue between cups and saucers if they rattle as you walk by. Add period accessories to your tea set display. For example; if your tea set is English Staffordshire, add a metal English Breakfast Tea tin to your display. 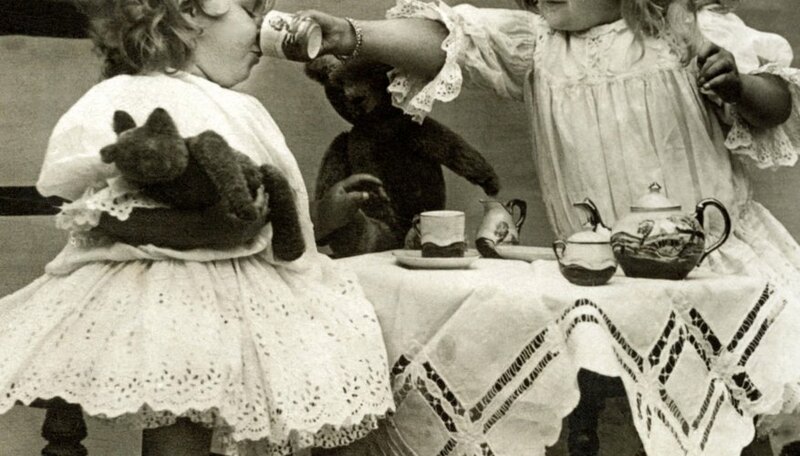 Old photos of ancestors using the tea set also make great accessories.